Mmmmm how I love the flavor profile of this stew! The coconut milk, curry, sweet potatoes, and a touch of cinnamon give it a slightly sweet flavor that’s both light and delicious. The coconut milk is pureed with some of the sweet potatoes, then added to the broth to give it a creamy, velvety texture. 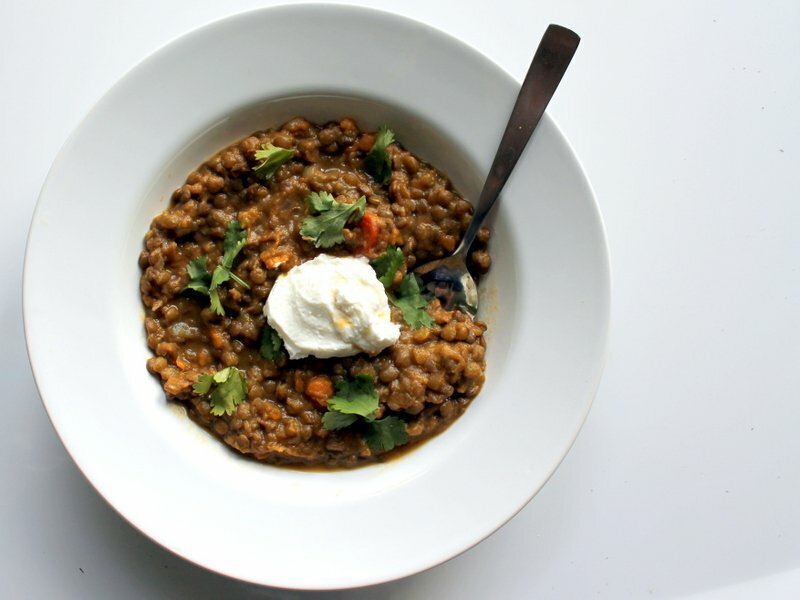 Ohhhh and who could forget about the lentils? They’re the star here! 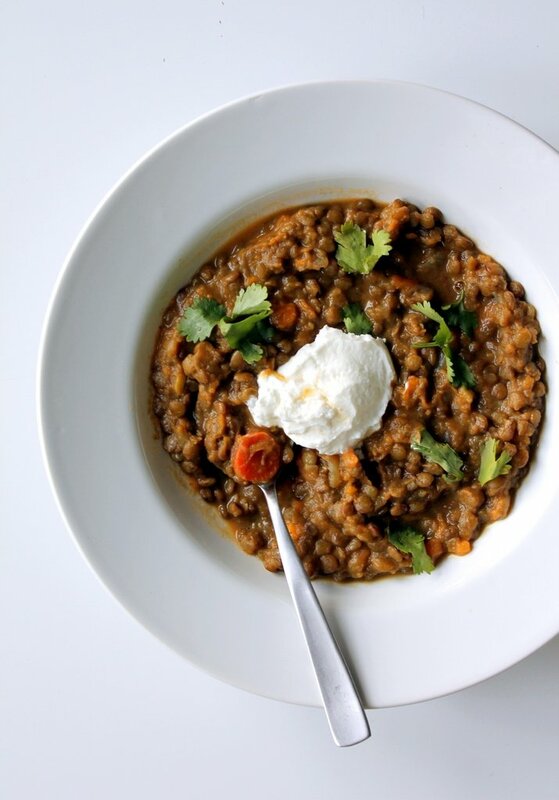 Lentils are perfectly healthy, low in calories, packed with vitamins and minerals, and full of fiber! I almost forgot to tell you that this is both vegan and gluten-free (the greek yogurt is used as a garnish, so simply omit if vegan)! 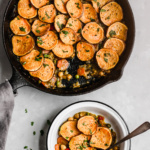 Even if you don’t have dietary restrictions, I think you’ll enjoy this comfort stew, plus it’ll help you to forget about thin mints and emails. Double win! A vegetarian (and vegan!) 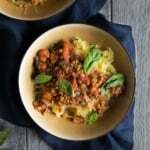 gluten-free healthy stew with lentil, sweet potatoes, curry and coconut milk. Filling and delicious! Heat olive oil in a large pot over medium-high heat. Add onion can carrot, and half of the diced sweet potatoes and saute until the onions begin to soften and turn translucent about 4-5 minutes. (Note: the other half of the diced sweet potatoes will be reserved for later use.) Add the garlic, ginger, curry powder, tumeric, and salt and saute for 2 minutes longer; stirring frequently. Next add the vegetable broth and lentils, and bring to a boil over high heat. 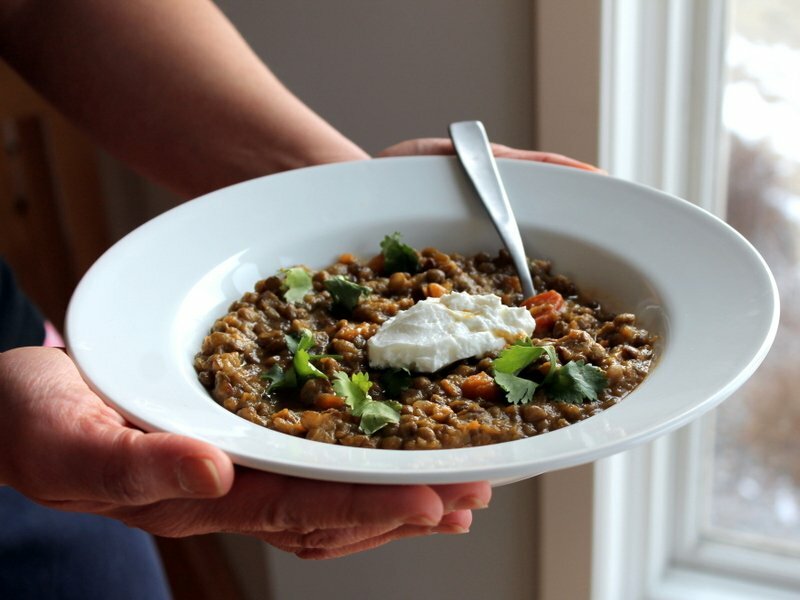 Cover the pot, reduce heat to medium low, and simmer for 30-45 minutes or until lentils are tender. While stew is simmering, make the coconut-sweet potato broth: Place a medium pot over high heat and fill with water, bring water to a boil and add in the rest of your diced sweet potatoes that you had set aside. Reduce heat to medium, cover, and continue to cook for about 8 minutes or until sweet potatoes are tender and nearly falling apart. This make take more time depending on how small you cut your sweet potatoes. 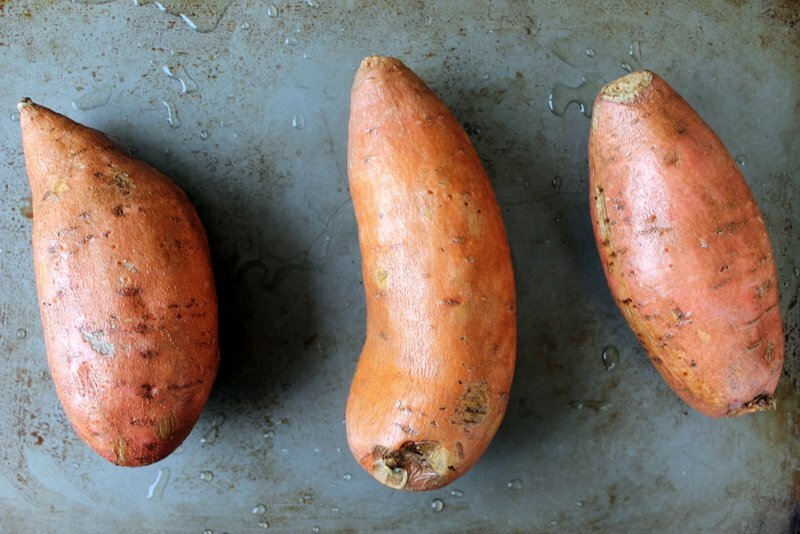 Once tender, drain water from sweet potatoes, and place them into a food processor. Add coconut milk and cinnamon and puree until it forms a somewhat smooth consistency. Next add the sweet potato coconut puree to the stew, and continue to cook to thicken broth a bit. 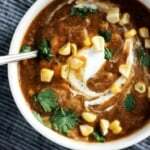 The stew is done when all of the lentils are tender, and the broth has thickened. Season soup to taste with additional salt and/or pepper. Scoop into bowls, and garnish with fresh herbs and greek yogurt if desired. 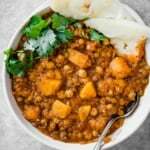 56 Responses to "Coconut Curried Sweet Potato and Lentil Stew"
This looks so healthy and tasty and wonderful. I have a coconut recipe coming. It’s not lentils 🙂 I need to do what you’re doing..lol Seriously coconut milk can do no wrong, especially in soups! And I love sweet taters, in soups, too! I have a few coconut milk + sweet potato soups I make. Love yours! I have so many coconut recipes coming, it’s unreal! Can’t wait to see yours. This looks so good! I’m assuming you mean the canned coconut milk, is that correct? 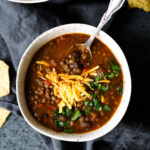 Lentil soup is so amazing but adding in curried sweet potato probably makes this AH-MAZ-ING! Oh my – you’ve managed to fit just about all of my favorite (savory) ingredients into one dish – I absolutely love coconut milk in anything. Girl Scout Cookies – is there anything more dangerous? I’d rather pretend that I don’t realize just how many thin mints are packed into one of those little sleeves! I made this over the weekend and it was delicious… although I accidentally put about twice the amount of coconut milk in! I just wasn’t paying attention… turned out ok though, just a bit more soup-like! Thanks for the recipe! Do you think I could put this in my Crock? Hmmm I’d think so, although I’m not sure if the sweet potatoes would break down entirely. Try it — either way it’s sure to be good! Made this last night and it was delicious! Looking forward to checking out more of your recipes on your blog. I don’t have a food processor, but I have an electric hand mixer. Do you think that would work for the sweet potato and coconut milk? Maybe I’m totally missing it but…how many people does this serve? looks so good….wish I had the oomph to go get these ingrediants! :) looks like something to look forward too….. Suggestion? What about roasting the second half of the sweet potatoes while cutting and prepping all the other stuff? It adds such a yummy flavor, and that way it's done by the time you're ready to deal with step 3…. Just made this for my lunches this week. I didn’t have Greek yogurt so I topped with a tablespoon of goat cheese. So yummy! I have a smaller serving set aside to give my 18 month old tonight. I think he’s going to love it too! Can this be frozen for later or would it be too mushy defrosted? Hmmm. My guess is on the mushy side…. Thank you… we will enjoy tonight! I didn't have coconut milk. I did have coconut oil (organic, extra virgin); so, I used that and skipped the olive oil. I also threw all he ingredients in a crock-pot and 4 hrs later returned home to an apartment smelling like a divine restaurant. 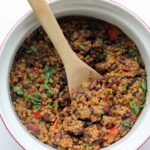 This looks like yet again another amazing recipe! thanks for sharing. All I can say is WOW! This is so delicious! I did not have canned coconut milk, but had the 45 calorie kind in the carton. I added a little more of this and also I added kale for some green. You have created a delicious recipe that includes so many healthy, anti-inflammatory foods. Thanks for sharing! We love this recipe, it's now a regular at our house. It's comfort food with an "exotic" flavor. Healthy too. Oh great idea. I am making this tonight and I think I am going to roast the other half of the potatoes. 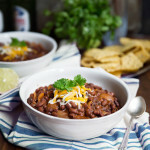 Just tried this in a slow cooker and it turned out great! Only had 1 sweet potato and lots of carrots so mine was more like lentil carrot stew. I did pre-cook the carrots, sweet potato and onions before throwing them in the slow cooker. After 4 hours in the slow cooker, everything tasted fabulous! This was awesome! I’ve been wanting to make this since I first saw it here, but most of the ingredients aren’t things I have readily on hand. I finally got around to it tonight and it was such a hit. I pre-chopped everything the night before (because I knew I wouldn’t want to mess with it when I got home from work), so it was pretty quick for me to make. I had to add some extra vegetable broth (mine got way thick) and I doubled the curry powder (at least). Towards the end, I added just a touch of coconut milk to the stew to thin it out just a little more. I made spicy sautéed shrimp to go with this and the flavor combinations were to die for. I might have some of the leftovers with a Greek yogurt garnish. Thanks for this one! 'think I will try that, it looks delicious ! Just made this it was MINDBLOWINGGGGG and I don't know how but I manahed to get it down to 6 servings of 265 calories each, so I'm dead pleased =] thanks!! I made this tonight, and loved it! Used red lentils instead. Thanks for the share–delicious! This is very good but we found it a bit too sweet. I’m planning to try it again using butternut squash – will report back. I also added 1/2 lb of defrosted chopped spinach with the liquid squeezed out. Did you know that 2016 is The Year of the Pulse? This was absolutely delicious and simple to make. Thank you! Made this last night in the crock pot. Cut recipe in half. Added coconut milk last hour of cooking. Soups and stews always taste better after sitting overnight so I warmed up for lunch today, added some red pepper for a kick and baby spinach for some green. All I can say is WOW! This is one of the tastiest stews I have ever tried. Thanks so much for this recipe!!! Hi have stumbled across your blog and love your recipes can’t wait to try them. In order to save a little time, could I use canned sweet potato puree or pumpkin? I hope you get a chance to try this one! The serving size is about 1/8th of the entire recipe (I’d say it’s about 1 heaping cup). Enjoy! I made this last night and am so glad I did! It is thick, filling, and so good. I absolutely love sweet potatoes, and especially enjoyed the flavor combination with the spices and the coconut milk. The coconut mile and sweet potatoe puree was like a dessert! I would make that again as a stand alone! Thank you for sharing this excellent recipe! Made this for dinner tonight and am going to use the rest to pack for lunches this week. SO delicious. I didn’t have ginger or turmeric so I skipped those two ingredients but I think it still turned out great! Even my husband liked it and he pretty much rejects all things vegan 😉 .